A trip to Target and we found a huge pack of Glow Sticks for about $5 in the Toy Section of the store. We splurged and got one for each girl. As the sun began to set we cracked open the packs. The girls got busy using the provided connectors and making “stars” in different color combinations. Then, magic! The sun set further and they tossed the stars into the deeper part of the pool and enjoyed watching them sink and move in the water. “I wish we had an underwater camera,” said my oldest after coming up for a breath and telling me how it was beautiful watching their creations dance in the currents under the surface. It was just as beautiful from the top of the pool too, but one of those moments a camera just can’t capture perfectly. So grab those glow sticks and hop into the pool with the kiddos for a simple twist on the usual. We are going to go over to my Dad’s house to try this in Grandpa’s pool! 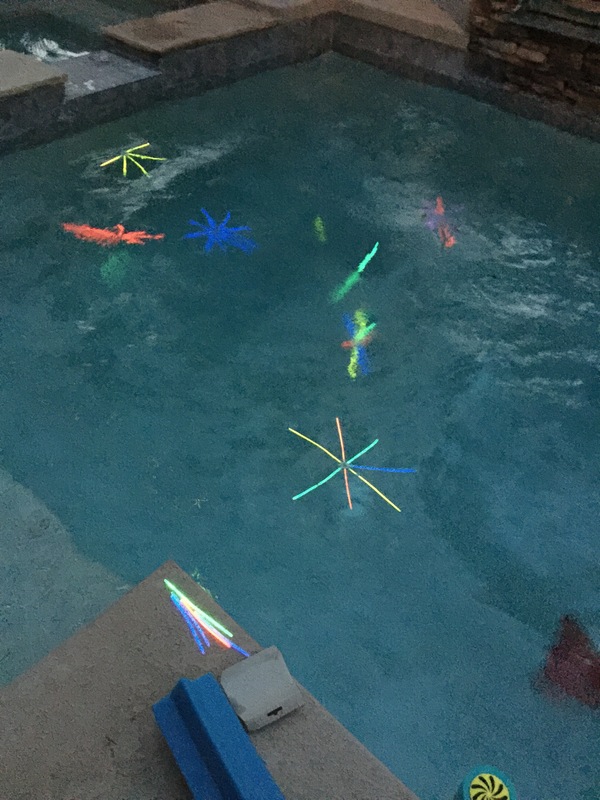 Swimming at night is always our favorite – I can’t believe we didn’t think of glow sticks before! And I understand about growing up so fast – doesn’t it seem like they were just babies and now, grade school!! Yes, I don’t like it one bit! I want to keep him little forever!! Awww, me too. I love babies and all things that go with having a newborn. And toddlers too – learning to walk and talk is such an exciting time! And on and on right! All of it so amazing – we Moms have the best job in the world! Thanks! If you make any of these, we’d love to see! You can share your photos with us (any photos of you out and about with the kids too! We love all of them) on our FB page. Yes! So fast I know – whenever I look back through photos I realize how quickly time goes! We do this for birthdays in our bath tub. Im sure my kids would love it in a pool! That is such a FUN idea! What great memories you are making for your kids! We would love to see photos! I think we are connected on IG – just tag us and we will see for sure! Thanks for sharing the Birthday idea – love it! I love the bucket list idea!! Would be a gr8 idea for vacations as well. Instead of plannin every minute, just make a list and check them off as you complete them. Yes! Me too! We made a bucket list for the summer and are excited that we still have a few things left to do! I never thought of doing it for vacations – that is a fabulous idea! I really like this idea! Thank you for sharing! Yes! And makes for great photos too! Yes! Let us know if you try and post pics on our FB page! We would love to see your photos if you try this! Are we connected on Instagram? Just tag us so we can see! Awesome idea! Always great kid ideas from Active Moms! Thank you! Appreciate your kind words – they mean a lot coming from an awesome Active Mom like you! Let us know if you try it – we heard back from one Mom that was going to try it in the tub! Thank you! Means a lot coming from an awesome Active Mom like you! Share your pictures with us on FB if you try it! 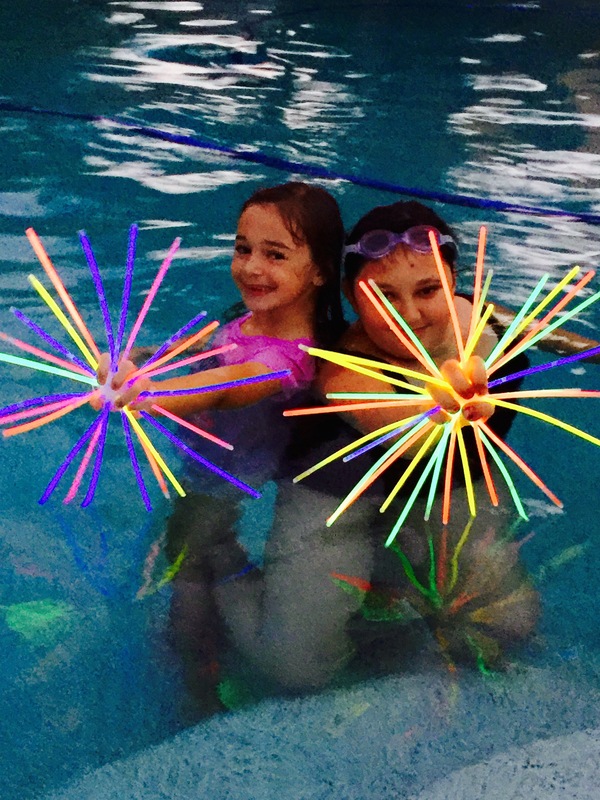 We’d love to see your two cutie pies having fun with the glow sticks! I Love the bucket list! Me too! Do you have one for this summer? We still have Wet N Wild to do – my son loves it there! We like to do the water slide with the boat in the smaller kids area – we go over and over again! Also, we have go to the Salt River and try and see the wild horses! Anything left on your summer bucket list? Anyting fun you already did? Yes! So fun! And makes for great photos too! We had one awesome Active Mom who does this in the bathtub for the kids’ birthdays to celebrate! So creative! If you do this, post pics and tag us – we love to see! Thanks for being such an amazing Active Mom and thanks for sharing the Active Moms love too – we appreciate that and you so much!!! Love the bucket list. We do this sometimes on our out-of-state vacations, but would love to do it at home.